Sweet Cheeks Adventures: Active Accessories make great Stocking Stuffer! Active Accessories make great Stocking Stuffer! I have a perfect stocking stuff for your girl this Holiday Season! 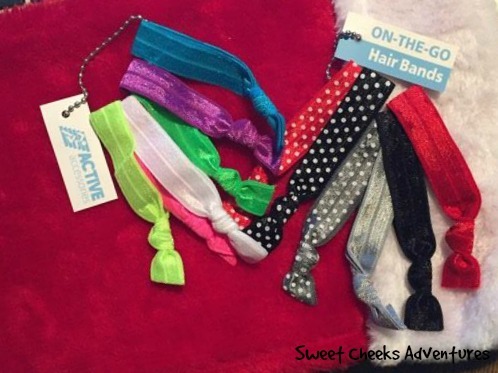 Active Accessories makes On-The-Go Hair Bands! These bands are soft, stretchy elastic ribbon that will help keep your hair up tight during a workout or simply a long day at the office! On-The-Go Hair Bands are perfect for Allyson's hair. She was blessed with a medium thickness, so these bands don't slip too much and they're easy to put in! These Hair Bands make perfect stocking stuffers! They're small and come in such a great variety. Pick some up for yourself and some for your long haired friends.